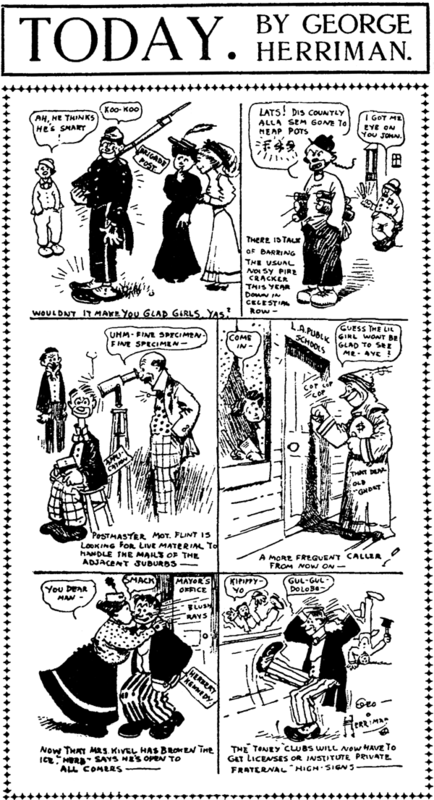 Friday, January 31, 1908 -- Apparently it's a slow sports news day, so Herriman's new series, Today in Sports, becomes simply Today and comments on some local news stories. H also supplies a cartoon to accompany a story about fire commissioner Anthony Schwamm, who declares that L.A. needs small firemen because they are braver and more agile. 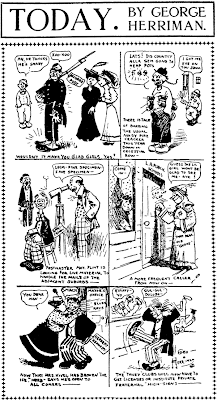 When Hearst spun off a new syndicate called Newspaper Feature Service in 1913, a selection of Sunday color comics was offered, few of which found their way into many papers. In fact the Boston Herald seems to have been one of very few subscribers who stuck with the service for any length of time. Unfortunately I did not have time to index that paper past 1914 on a frantically busy research trip to Boston, so this 1915 series was unknown to me when Cole Johnson sent a sample. The Troubles of the Titmouse Twins is a rather interesting series, too. All I know is that it was running by August 1915, and Alfredo Castelli cites it as surviving into the next year. But the really interesting part is the creator. The strip is signed John Barton, a name that doesn't appear elsewhere in my listings. And obviously he was quite the accomplished cartoonist from this fine example. A Google search on the name quickly offered a tantalizing clue. Although no illustrator or cartoonist by that name was apparent, I did find that Johnny Gruelle, creator of Raggedy Ann, had the middle name of Barton. Comparing the art on this sample to other Gruelle work of the time, I'm pretty well convinced that we have Gruelle here working undercover. Gruelle liked drawing mouse characters, they usually were drawn like these characters, and there are other telltale signs in the art, too. Why would Gruelle have worked under a pseudonym? Simple -- he was gainfully employed by the New York Herald at the time producing one of their flagship features, Mr. Twee Deedle. EDIT: Since determined that the feature ran 5/30 - 10/3/1915. Good art-Spotting and research, Allan! 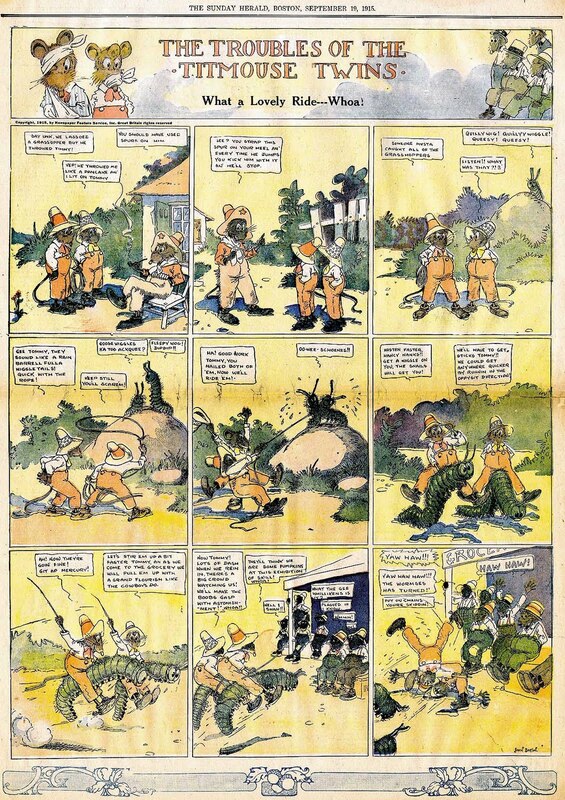 Now that you point it out, it's obviously Johnny Gruelle's work. Leonard Hjalmar Edgren was born in Illinois on January 10, 1880, according to Edan Hughes (Artists in California, 1786-1940). He was the younger brother of Robert, the sports cartoonist and writer. The Edgren family resided in St. Paul, Minnesota, as recorded in the 1885 Minnesota Territorial and State Census. He was the third of four children born to John Alexis and Anna. In the 1900 U.S. Federal Census, the family lived in Oakland California at 1319 Filbert Street. Edgren was a student at the time. The date of his move to New York City is not known; according to an E&P 1939 obituary, his brother Robert "became associated with the old New York Evening World in 1904 as sports editor." 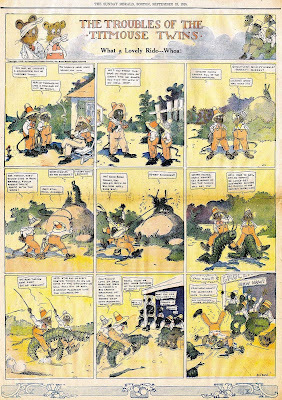 Young Edgren's strip, The Sorrows of Solomon Swellhead, began in 1904. On January 26, 1908, Reverend Edgren passed away; he was the founder of the Swedish Baptist Theological Seminary of Chicago. The Oakland Tribune obituary said that his sons were in New York. Edgren resided in Brooklyn, New York at 136 State Street, according to the 1910 census. At some point he returned to California. Hughes wrote, "Due to shock from a gall bladder removal, he died in San Mateo, CA on Jan. 6, 1918." Alex Jay has accepted my invitation to become a contributor to the Stripper's Guide blog, and his first official post was yesterday. Of course you have seen his byline on the blog before, but always previously in posts filtered through me, or in the form of comments. Alex is an absolute wiz at digging up biographical information about comic creators, and his posts will be primarily geared in that direction. I know we all wonder who in the world some of these nigh-anonymous cartooning folks are, myself most definitely included. I have no gift for genealogical-type research, but Alex definitely has the touch for unearthing often surprising information about these folks. I can't wait for his post on Billy Liverpool, for instance -- there will be surprises! I hope you'll all join me in offering a hearty welcome to Alex, a great addition to our newspaper comics sleuthing arsenal here at the blog! You both do a great job in bringing us readers obscure art and bios on forgotten artists of the past! Looking forward to Alex's fascinating posts! In the latter years of Gene Carr's long association with the New York World he eased up on his tremendous workload a bit. In the period 1917-20 his two main features were Lady Bountiful and this one, Poor Mister W. This strip was a fairly nondescript family sitcom featuring a harried hubby. It had little if nothing out of the ordinary to recommend it. 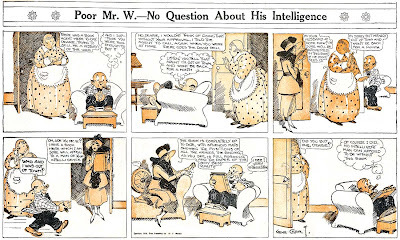 In fact the only aspect that I find interesting is the little conceit of often having Mr. W's speech balloons appear within puffs of smoke from his cigar. Poor Mr. W ran from April 8 1917 to March 28 1920. 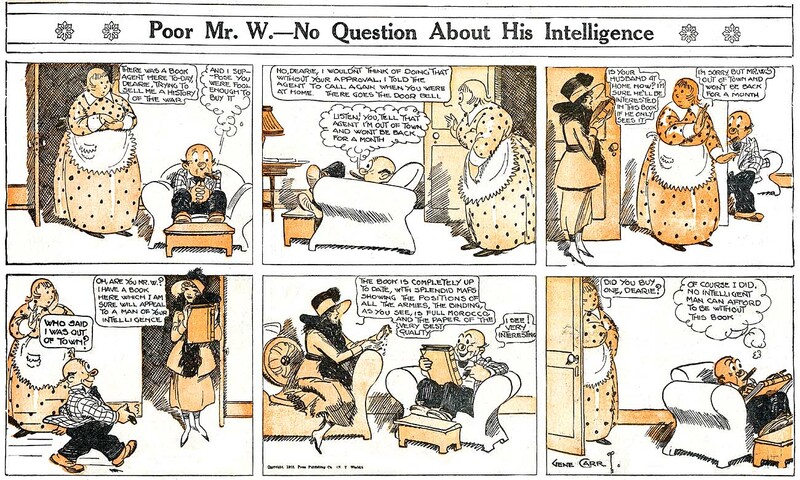 Many of the strips are unsigned, which is unusual for Carr. I wonder if a ghost was often charged with producing this strip. Glencora W. S. "Glen" Ketchum was born in St. Louis, Missouri on April 23, 1897, according to a May 1933 New York passenger list and the Social Security Death Index. She was the youngest of two daughters born to Marcellus and Adele, as recorded in the 1900 U.S. Federal Census; the family lived at 2221 Fan Avenue in St. Louis. In 1910, her mother was the head of the household at 3011 Eads Avenue in St. Louis. Ketchum was a student at Washington University in St. Louis according to a 1912 university catalogue. Taylor said, "…in 1919 and again in 1925 he attended the [Art Institute of Chicago] evening division, studying etching." Ketchum was a lodger in Chicago at 434 Arlington Place during the 1920 census. Her occupation was commercial artist in a studio. Volume one of My Book House was released that year by a Chicago publisher; she contributed spot illustrations for a number of nursery rhymes and illustrated four stories including Goldilocks and the Three Bears. A copy of the book can be downloaded at Google Books by searching these names together, "Glen Ketchum NC Wyeth". In 1930 Ketchum lived with her mother in Minneapolis, Minnesota at 2919 West 43rd Street. Her occupation was artist, and the cartoon panel, Mayme the Manicurist, appeared that year. The date of her move to the New York City area is not known. On May 21, 1933 she returned from a trip to Naples. A New York passenger list gave her address as "38 Wine St. Larchmont, N.Y.", a suburb north of New York City. It's possible she attended Pratt Institute in the early 1930s. A few years later she was married to Franco Maresca. A May 1940 passenger list recorded her and her children, a 4-year-old girl and 2-year-old boy, on their return from Genoa. The list had the same address as the one in the 1930 census. Later in the 1940s Glen Ketchum Maresca became a teacher and settled in Stratford, Connecticut (Teachers College Record: Volume 46, 1945). The date of her husband's death is not known. Both of their children married in the 1960s. The National Museum of Women in the Arts website has a listing for Ketchum at Clara, Database of Women Artists; her medium was painting in watercolor, oil, and for frescoes. She passed away in Darien, Connecticut on May 26, 1982, according to the Connecticut Death Index, and was buried at Friedens Cemetery in St. Louis, according to the website, Headstones at Friedens Cemetery. I am Glen's daughter. I would like to correct some facts. The St.Louis info is correct. Column featuring fashion. Also belonged to a group of professional artists called The Attic Artist. I think. Mame was born....It was a daily....I have a number of them clipped and saved. With an agent(January 28,1930 ) Alfred M. Loewethal, Chicago. I believe I have found some of those illustrations. She lived at 4200 Xerxes Ave S Minneapolis in 1930. Advanced Student Minneapolis School of Fine Art. 1930-1931. Won the Ethel Morrison Van Derlip Traveling Scholarship in 1931. Ended up in Sorrento and studied fresco painting. While there she met my father, Franco Maresca, the director of a luxury hotel in northern Italy. They married,  my brother and I were born. War was coming and the 3 of us " escaped" (think Winds of War). We've talked a little before about the Chicago Tribune rather timidly sticking its toe into the world of Sunday funnies at first. Here's another good example of that. This little strip, penned by the more than capable hand of Roy W. Taylor, was a little addition to Merry Andrew's Page, a sheet of jokes, poetry and other miscellany that ran in the Trib for a short while. The Andrew Family, aka Merry Andrew, aka Johnny Andrew ran four times from November 17 to December 15 1901. Thanks to Cole Johnson for the scans (and for that matter, pointing out the existence of this feature which I missed in my own indexing of the Tribune). Note: today's cartoon references this previous installment of Jim Ivey's Sunday Comics. Oh, no! I am being brainwashed by another feeble, leftist, drawing!! Is this supposed to be a self portrait of jim ivey? The empty skull certainly is a good likeness. Trade in your overstock of smug and trade it in for some drawing lessons! Wow. Custi goes right for the personal attack. He/she must not understand that the whole purpose of a political cartoon is to get the reader to THINK. I've seen lots of political cartoons over the years and some of my favorites haven't always expressed my personal political views. Of course, when they didn't I immediately posted insulting comments towards the artist. Wait... sorry, that wasn't me who posted the insults, it was Custi.